Come Spin-to-Win at the USPT Athletic Trials in Columbus, OH., January 14th, 2019! Calling all pizza athletes do you have what it takes to be the best? 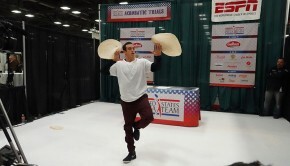 Try your hand at Freestyle Acrobatics, Largest Dough Stretch, Fastest Pie Maker and Fastest Boxfolder. 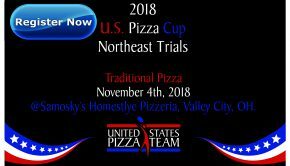 Grand prize for Freestyle will be a trip to Parma, Italy, to compete in the World Pizza Championships as a Premiere Member of the U.S. Pizza Team! Register your crew below to sign up for one, two, or even all of the events! They will be held on Monday, January 14th, beginning at 10 am! 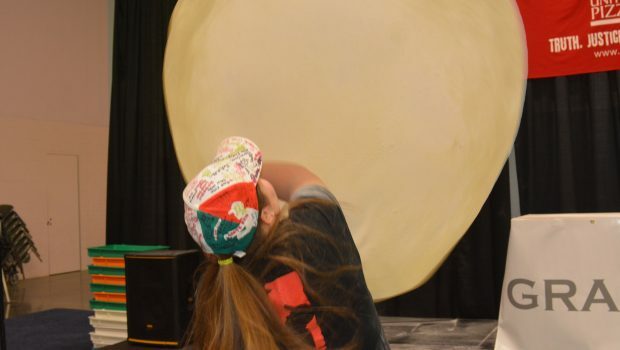 Contestants hand stretch a dough ball as large as possible in 5 minutes. Contestants must be 18-years-old or older to compete and work in a pizzeria or restaurant. All event fees must be paid at the time of registration. You will not be allowed to compete unless your event fees are paid. The following are ineligible for any United States Pizza Team competition: employees of PMQ Pizza Magazine or their families. Contestants order will be drawn at the beginning of each event. A random letter will be selected, and each competitor will go alphabetically from that letter. 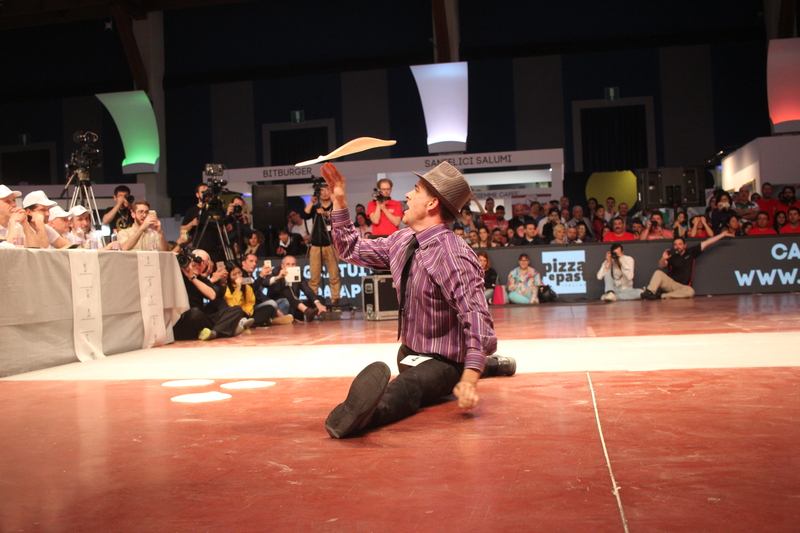 This mimics the rules at the World Pizza Championships in Italy. 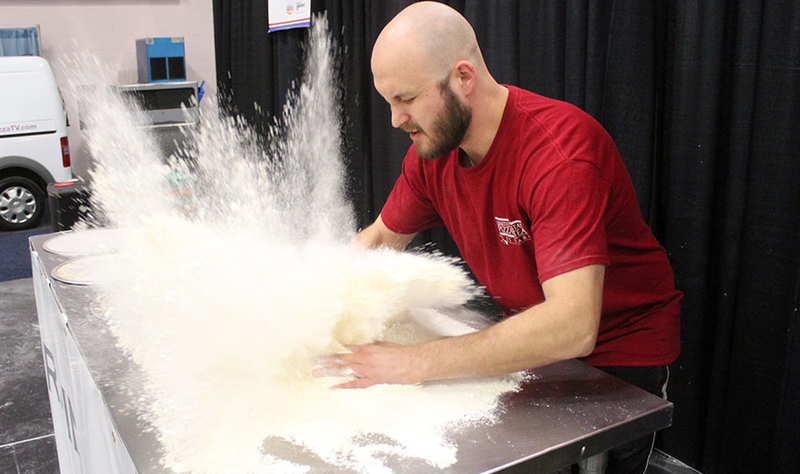 Contestants have five minutes to hand stretch or toss one 18-ounce dough ball to the maximum size. without tearing the dough (no rolling pins allowed). The dough will be made with cold water and half the normal yeast to provide the best dough possible to work with. Only dusting flour can be used to help stretch the dough. Oil, water, corn meal or other materials may not be used. Contestants may request as much flour as they see fit. Organizers will place one dough ball for each contestant in the pile of flour on the contestant’s table. referees and contestants are not to dust the top of the dough ball with flour or touch the dough balls until the allotted 5 minutes begins. If the contestant feels that the dough ball is damaged they may request a new one. If the referees concur that the dough ball is damaged they will replace it. A maximum of one dough ball may be replaced. Referees will count down “3 – 2 – 1 – GO.” Referees will start stopwatch on “GO.” In the event of a mis-start by competitor, they may be disqualified. In the event of a malfunction of the stopwatch, the referees will immediately stop the competition. Table will be reset with a fresh dough ball and the contestant will start over. Holes can be repaired as long as this is done within the five-minute time limit. Holes bigger than a dime will disqualify entry. If the hole is oddly shaped and cannot be readily determined if it is larger than a dime, the referees and the organizer will cast a majority vote and arrive at a final decision. If at any point the dough touches the ground, the competitor must immediately move to the ground to finish stretching the dough. Once on the floor the contestant is free to continue stretching the dough. However, the “lick and stick” method is not allowed (wetting the dough to make it stick to the floor). Kneeling on any part of the dough is also prohibited and may lead to disqualification. The dough must be in round or oval form. Square, rectangle, star, quadrangle, trapezoid, rhombus, or similar shapes are not allowed and will be disqualified. When 4:50 minutes is reached the timekeeper will count down in 1 second intervals from 10 to 0. At 5 minutes, the referees will announce “stop!” signaling the contestant to immediately raise their hands into the air and back away from the dough. If the contestant fails to stop working the dough, he/she will be disqualified. The referees will take two measurements of the dough. They will use a measuring stick or tape measure to measure the widest diameter of the dough. That measuring device will be left in place and its midpoint will be used to take a perpendicular measurement. These two measurements will be averaged together for the final score. The contestant’s own score will be shown to him/her, but all other scores will be kept confidential until the end of the event. Contestants must be ready to be compete at the scheduled time. Any disputes or concerns about the results, the way in which the contest was judged, or concerns over the condition of the dough will be taken before the organizer who may appeal to a panel of judges if he/she sees necessary. In the event a competitor behaves disrespectfully he or she will be disqualified and removed from the area. No “practice runs” will be allowed. Contestants race to stretch out five 10oz. dough balls onto pizza screens. 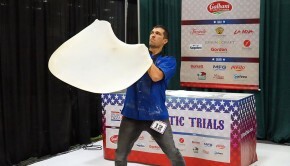 Contestants will stretch/toss out five 10-ounce dough balls to cover five 10-inch pizza screens in the shortest amount of time possible (no rolling pins allowed). 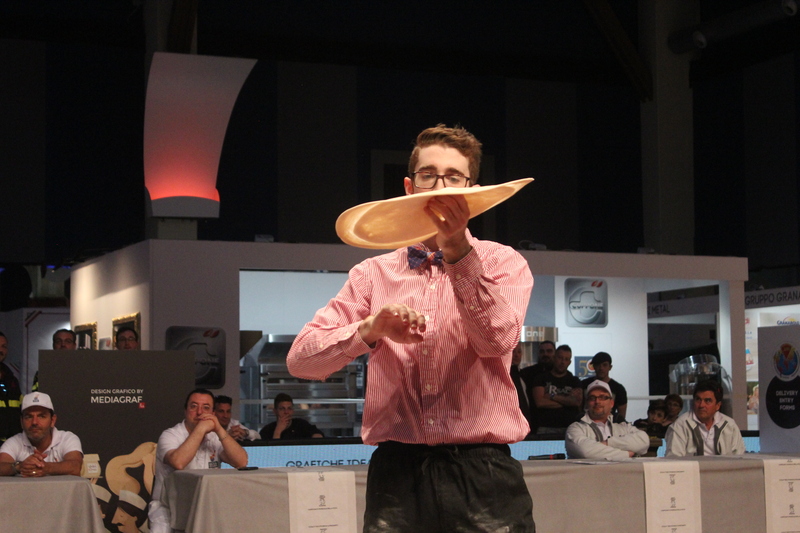 Tables and screens will be cleaned of excess flour between each competitor. If the contestant feels that the dough ball is damaged they may request a new one. If the referees concur that the dough ball is damaged they will replace it. A maximum of one dough ball may be replaced. Referees will count down “3 – 2 – 1 – GO.” Judge will start stopwatch on “GO.” In the event of a mis-start by competitor, they may be disqualified. In the event of a malfunction of the stopwatch, the judge will immediately stop the competition. Table will be reset with fresh dough balls and the contestant will start over. Only one stainless steel table will be provided for both working the dough and laying the doughs down on the screens. Each doughball must much completely cover each screen with no metal showing. Even if the dough initially covers the entire screen, it may retract and need to be reworked to completely cover the metal again before the referees can stop their watches. The clock will continue to run until holes are repaired and all of the screens are covered with dough. There will be no “fix it time.” Referees will point out repairs on the fly. Times will be measured to the hundredth of a second. Two referees will keep time on stopwatches. The average of their times will be used for the final score. The contestant’s own time will be shown to him/her, but all other scores will be kept confidential until the end of the event. Contestants must be ready to compete at the scheduled time. Any disputes or concerns about the results, the way in which the contest was judged, or concerns over the condition of the dough will be taken before the organizer who may appeal to a panel of judges if he/she sees necessary. In the event a competitor behaves disrespectfully, he or she will be disqualified and removed from the area. Contestants spin dough in an acrobatic routine to music. If for any reason the winner of the Grand prize all-expense paid trip to the World Pizza Championships cannot fulfill his/her obligations to compete in Italy, the prize will fall to the next highest scoring competitor. If no competitor can make the trip, the prize is forfeit. Contestants must be 18-years-old or older to compete and work at a pizzeria or restaurant. The following are ineligible for any United States Pizza Team competition: employees of PMQ Pizza Magazine or their families, employees and families of anyone affiliated with any other pizza team, pizza publication or pizza trade show. Contestants will perform 3-minute acrobatic dough tossing routine set to music they provide. Music will be stopped at 3 minutes. Competitors will be given 10 8-ounce dough balls. Two dough balls will be put together to make one dough ball, giving each contestant five 16-ounce dough balls. Dough will be kept in refrigeration until the contestant starts. 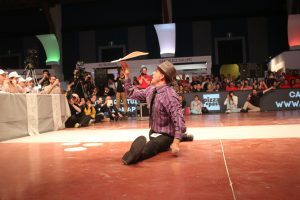 Contestants ARE permitted to bring their own dough for freestyle only. Flour, rolling pins, and a stainless steel table will be provided for the competitor to use on the stage. Contestants are encouraged to, bring their own rolling pins. Each contestant will have approximately five minutes to prepare their dough for the routine. Only dusting flour can be used to help stretch the dough. Oil, corn meal or other materials may not be used. Water is permitted only when preparing the dough before the performance. Contestants may use as much flour as they see fit. If the contestant feels that a dough ball is damaged they may request a new one. If the referees concur that the dough ball is damaged they will replace it. A maximum of one dough ball may be replaced. Fire, fireworks or other combustible materials are strictly prohibited. Contestants will be judged by a panel of impartial and qualified judges. Difficulty – Are they basic tricks that everyone does? Does the contestant venture into complex tricks? Is there a wide variety of tricks? How many doughballs are being used? Dexterity and handwork – How skillfully is the dough handled? Do they have total control of the dough? How versatile are their hand tricks? Can they spin in more than one direction? Do they drop the dough? Technique and originality – Is the dough continually spinning? Are transitions between tricks seamless? Is their overall style graceful and smooth? Is there anything unique about this pizza spinner’s style or technique that makes him/her stand out? Powermoves/Combos – Does the spinner perform handstands, flips, dance, or perform any other kind of dramatic acrobatics? Do they juggle? How well do they combine tricks to make impressive combos? To count, the spinners must keep the dough spinning while performing these feats. For example, juggling by simply catching and throwing the dough doesn’t count. Entertainment value – Is the music appropriate for moves performed in the routine? Does the routine maintain an entertaining energy? Is the routine synchronized to the music? Does the contestant have good stage presence and sportsmanship? Does it hold the audience’s interest? All scores will be kept confidential until the end of the event except for the “entertainment value” category. Judges will use paddles numbered 1-10 to publicly score the contestant’s entertainment value immediately after he/she performs. Contestants must be ready to be compete at the scheduled time. Any disputes or concerns about the results, the way in which the contest was judged, or concerns over the condition of the dough will be taken before the organizer who may appeal to a panel of judges if he/she sees necessary. Judges scores are final. However, in the event of an obvious unfair score, that particular score will be thrown out and the remaining judges’ scores will be averaged together. The first-place winner in this contest will earn a spot on the U.S. Pizza Team and an all-expense paid trip to the World Pizza Championship. Contestants compete in Freestyle, Largest Dough Stretch and Fastest Pie Maker events for a discounted registration fee of $125. Contestants will be given 5, square, four-flap pizza boxes. Top and bottom tabs will be broken before-hand by referee. Contestant may point out broken or damaged boxes. Only on box may be replaced. Contestant will not touch the boxes before the referee starts the event. Contestant will be allowed to ask for the boxes to be placed right side up or upside down on the table. No other customizations will be allowed. The referee will start the event by saying 1-2-3 Go, then the contestant will fold each box completely, including the front flap, as fast as they can. All boxes must be placed on the table and the contestant will have no hands on them before the clock will stop. There will be 2 stop watches timing the event. The average of both timers will be taken. Register your crew above to sign up for one, two, or even all of the events! They will be held on Monday, January 14th, beginning at 10 am!